Overview - This psychologically acute, visually striking modernist work was director Michelangelo Antonioni's follow-up to the epochal L'avventura. Marcello Mastroianni and Jeanne Moreau star as a novelist and his frustrated wife who, over the course of one night, confront their alienation from each other and the achingly empty bourgeois Milan circles in which they travel. Antonioni's muse Monica Vitti smolders as an industrialist's tempting daughter. Moodily sensual cinematography and subtly expressive performances make La notte an indelible illustration of romantic and social deterioration. A woman stands motionless, peering out over the party below her. There, in a quiet break from the playful commotion and boisterous dialogues, she spots her husband and a young woman together -- together, and alone. Unaware of their clandestine admirer, the two share an illicit kiss beneath the moonlight. From a distance, she sees it all, but it is not jealousy, or scorn, or hatred that fills her weary eyes. No, it is something worse. Something much worse. It is apathy. Cool, detached, and wholly indifferent. A melancholy examination of dwindling passions, Michelangelo Antonioni's 'La Notte' quietly aches and sizzles. As the faded memory of love momentarily struggles for survival, and the icy realities of emptiness take hold, the film reveals the bitter and devastating tolls of alienation, chronicling the tragic pain of nothingness through a highly influential modernist style. The film's loose narrative follows a strained married couple, Giovanni and Lidia (Marcello Mastroianni & Jeanne Moreau), as they visit a dying friend in the hospital, and then attend an extravagant party at a wealthy industrialist's home. Throughout the single day and night, the characters struggle to connect with one another, tragically yearning for the passion they have long since lost. Faced with the reality of their increasingly loveless union, they will have to decide whether to stay together or move on. More of a cinematic mood piece than an attempt at traditional storytelling, the majority of the film's runtime simply follows its two leads as they wander around various locations. An early extended sequence focuses on Lidia's exploits around the city of Milan, observing numerous, seemingly random occurrences, like a violent street brawl or a group of men setting off rockets. Later, the film settles into a frivolous bourgeois party, following Giovanni as he makes advances on a young woman (Monica Vitti) and Lidia as she considers engaging in an adulterous affair of her own. Though the climax offers some semblance of traditional drama, for the most part, these instances are all free from conventional beats and developments. Instead, Antonioni uses his stark images, meandering plot, and sparse, mournful dialogue to engender an intoxicating air of alienation and distance, employing intricately designed sights and sounds to create thematic substance, illuminating the internal struggles of his tragic characters while drawing a larger commentary on society as a whole. Through a modernist visual style that manages to be sensual, detached, literal, and abstract all at once, the director creates an aesthetic that often feels like a waking dream. Much like the film's characters, the camera seems to wander as well, and through lingering shots and a methodical pace, Antonioni forms a kind of elongation of time, establishing an unorthodox rhythm wrapped in isolation and mystery. Fully using his locations to his advantage, the director also artistically integrates the architecture of his subjects' surroundings into his images, using buildings and structures to elaborate on the film's overarching concept of emotional disconnection. Windows, in particular, become an essential aspect of the movie's visuals, and compositions are often layered with frames within frames, further boxing the characters into smaller spaces, reinforcing the figurative barriers between them. Victims of the complacency that plagues their social status, Antonioni's characters are riddled with aching desperation and tragic yearning. They drift from shot to shot, person to person, longing for a real connection, but finding only listless dissonance. They are the walking dead, clinging to the memory of life amidst insurmountable emptiness. They seek companionship, but find nothing to grab onto, for how can they form a real bond, when they themselves have nothing left inside to give? Both Mastroianni and Moreau realize this disenchanted indifference with striking restraint and sorrowful malaise. Of the pair, Giovanni is the most far-gone, barely even showing a desire or awareness for the love he's lost. Instead, he simply seeks to fill the emptiness with fleeting flirtations and momentary carnal pleasures. Mastroianni is perfect in the role, diluting his natural charm just enough to create a character that often feels like a faded facsimile of his usual charismatic persona. In contrast, Lidia stills shows a fragile hunger to rekindle the light in her heart, and Moreau's momentary bursts of playfulness are quite heartbreaking to watch. She always appears sad, even when she's not, even when she smiles, because in the back of our minds we know that it will only be a matter of time before it fades. In 'La Notte,' lovers touch and embrace, but forge no real connections. Though they hold each other in their arms, they might as well be miles apart, and this great emotional divide is given aching form through the director's striking compositions and hypnotic modernist style. Through the film's meandering narrative, Antonioni reveals the listless souls of his characters, offering a cinematic lamentation for decaying romance. Part of the director's "Alienation Trilogy" of thematically related and highly influential 1960s masterpieces (which also include 'L'Avventura' and 'L'Eclisse'), the movie offers a portrait of apathy in all its devastating indifference. Subtly absorbing and hauntingly intoxicating, this is a somber piece of defining motion picture art. 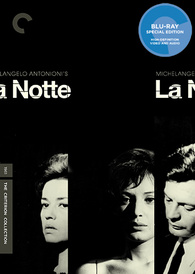 Criterion presents 'La Notte' in their standard clear keepcase with spine number 678. The BD-50 Region A disc comes packaged with a booklet featuring an essay by critic Richard Brody and an article by director Michelangelo Antonioni. The movie is provided with a black and white 1080p/AVC MPEG-4 transfer in the 1.85:1 aspect ratio. Authentic and filled with visually striking compositions, this is an exceptional video presentation. Outside of some fleeting specs and faint vertical lines, the source print is in very good condition. A light to moderate layer of natural grain is present throughout, giving the picture a wonderfully filmic appearance. Clarity is sharp with impressive fine details in textures and fine patterns on characters and architecture. Antonioni's sense of framing is impeccable, and the intricate compositions are full of depth. Likewise, the grayscale is nicely balanced with high contrast and bright whites that don't quite bloom. For the most part, black levels are also nice and inky, though some darker scenes do look a tad faded and there is some minor pulsing in shadows. Richly textured, strikingly photographed, and respectfully preserved, 'La Notte' comes to Blu-ray with a gorgeous video transfer. There are some minor signs of age-related wear, but overall the film looks outstanding. The audio is presented in an Italian LPCM mono track with optional English subtitles. With sparse but deliberate sound design, this is an artistically potent mix that enhances the alienated mood of the narrative. Speech is a bit thin, but dialogue comes through cleanly. Antonioni uses isolated sounds to draw out the film's ethereal style, and these specific effects all carry appropriate weight and presence throughout the single channel presentation. Traffic, rain, background clatter, and other ambient noises create a subtle but surprisingly effective sense of auditory tone. Likewise, the film's jazzy soundtrack (which mostly comes from onscreen sources) sounds good too, with solid fidelity and range. Thankfully, there are no major crackles, pops, or background hissing. Though the mix is a little thin, the track is free from any notable age-related issues and Antonioni's unique sound design is delicately immersive. Criterion has put together a small but very informative set of supplements that offer an interesting analysis of Antonioni's style. All of the special features are presented in 1080p with Digital 1.0 audio and optional English subtitles for the foreign language portions (unless noted otherwise). Adriano Apra and Carlo di Carlo (HD, 27 min) - Conducted in 2012, this is an interview with film critic Adriano Apra and film historian Carlo di Carlo. The participants discuss the film's unconventional narrative, muted drama, and deliberate use of sound. They also spend some time analyzing Antonioni's visual style, offering some interesting observations. Giuliana Bruno (HD, 31 min) - Here we get a 2012 interview with Harvard professor Giuliana Bruno. She focuses her discussion on the film's use of architecture in its visuals, analyzing Antonioni's framing and his use of structures and buildings to enhance the emotions and subtext of his story. Michelangelo Antonioni's 'La Notte' is a haunting and intoxicating examination of apathy and isolation. Through striking compositions and a hypnotic rhythm, the director gives visual form to the tragic space that lingers between us. On the technical side, the disc's video transfer is exceptional and the audio mix is very strong. Criterion offers a comparatively slim collection of special features, but the included interviews offer lots of worthwhile insights into the director's unique style. Antonioni's slow and contemplative approach won't be for everyone, but for fans of art house cinema, this release comes very highly recommended.